HOW can I make this idea more related to the events in the story? HOW can I play with words and phrasing to communicate how this idea is shown in the story more clearly? How can I make this theme more related to the events in the story? HOW can I play with words and phrasing to communicate this idea more clearly? Strong writers identify reasons that support their claim by looking over the evidence they’ve collected and noticing patterns. 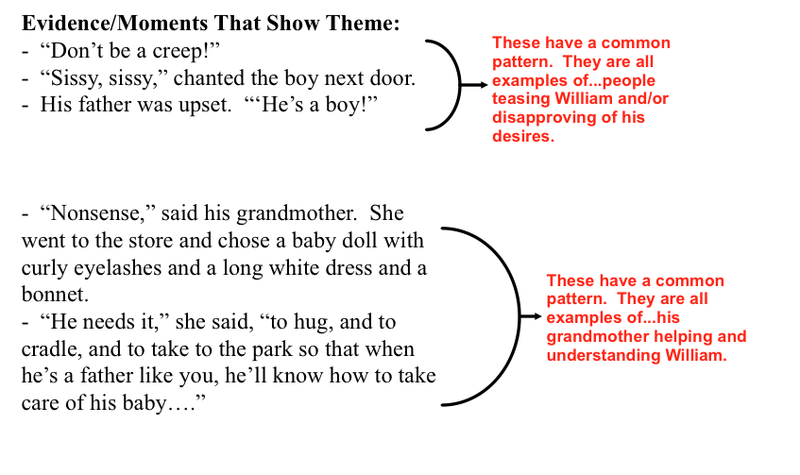 ​Good writers communicate ideas clearly by supporting their claims with specific reasons and evidence. 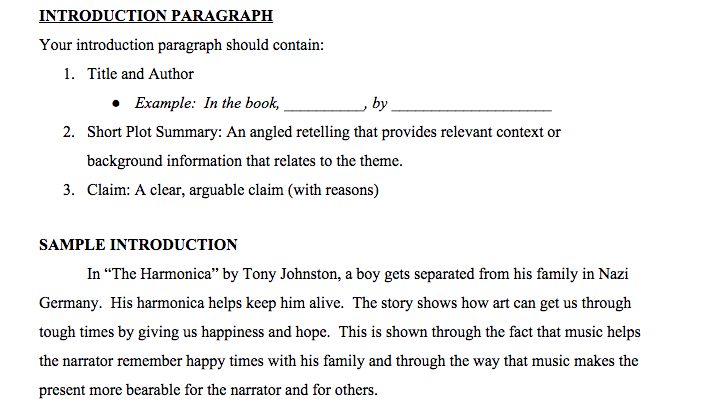 Claim with Reasons: In “The Harmonica,” the author shows how music can help us get through difficult times by inspiring happiness and hope. This is revealed through the fact that music helps the narrator remember happy times with his family and also makes the present more bearable for him and for others. Reason 1: The idea that music can help us get through difficult times by inspiring happiness and hope is shown through the way music helps the narrator remember happy times with his family. Reason 2: The idea that music can help us get through difficult times by inspiring happiness and hope is shown through the way music makes the present more bearable for him and for others. Read each quote below, find it in the story to understand the context, then place the number of each quote underneath the reason that it best proves. 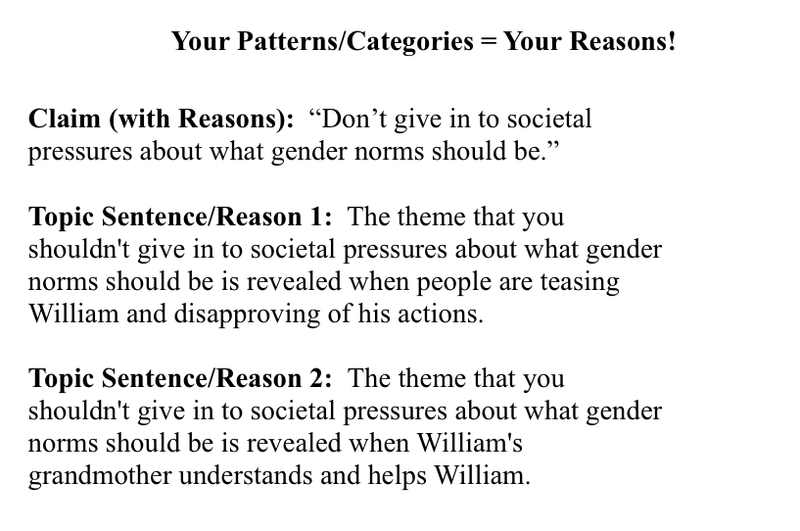 ​Strong writers craft thoughtful claims by finding supporting reasons and evidence. “...go to that sink and wash your face…here’s a clean towel. The idea that empathy is important is shown through the way that Mrs. Luella Bates teaches Roger a lesson. “...I have done things, too, which I would not tell you, son-neither tell God, if he didn’t already know”. Strong writers prepare to write thoughtful essays by creating outlines that contain a claim with reasons and supporting evidence. 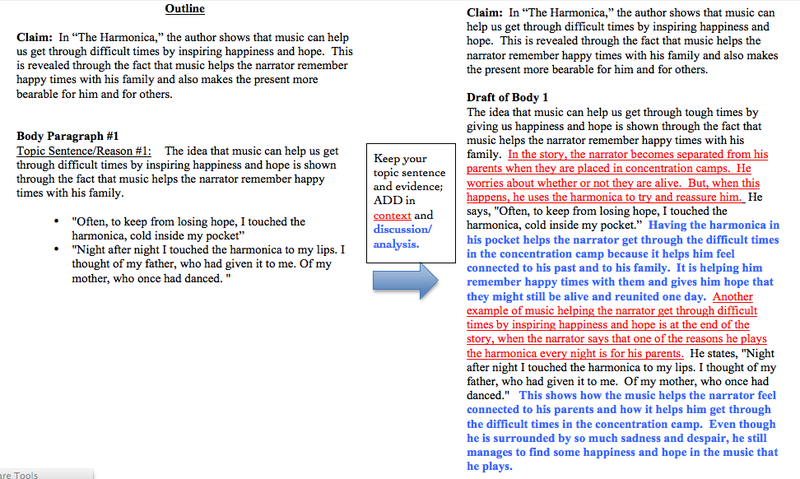 Strong writers communicate their ideas effectively by introducing and explaining evidence. ​Strong writers communicate their ideas effectively by introducing and explaining evidence. Claim: The idea that art can help us get through tough times by giving us happiness and hope is shown through the way that music makes the present more bearable for the narrator and for others. Topic Sentence: The idea that art can help us get through tough times by giving us happiness and hope is shown through the way that music makes the present more bearable for the narrator and for others. The idea that art can help us get through tough times by giving us happiness and hope is shown through the way that music makes the present more bearable for the narrator and for others. In the story, the narrator feels guilty playing the harmonica for the Nazi commandant because he knows that other people are starving while he is able to get food. But his feelings change when a prisoner thanks him for his music. The narrator says, “I despised myself for every note…until one day a whisper grazed my ear. ‘Bless you.’” This shows that the narrator’s music actually helps more than just than himself and the Nazi commandant. It turns out that his music is helping the other prisoners in the concentration camp survive by providing a beautiful sound and giving others hope. At the end the story, he decides to embrace his ability to help others through music. He notes, “I played for them, with all my heart.” This is significant because he uses music to not only help himself remember the joy he had with his parents, but also to help others by bringing them joy in terrible circumstances. Strong writers write powerful introductions by providing background information that establishes a context for their claim. 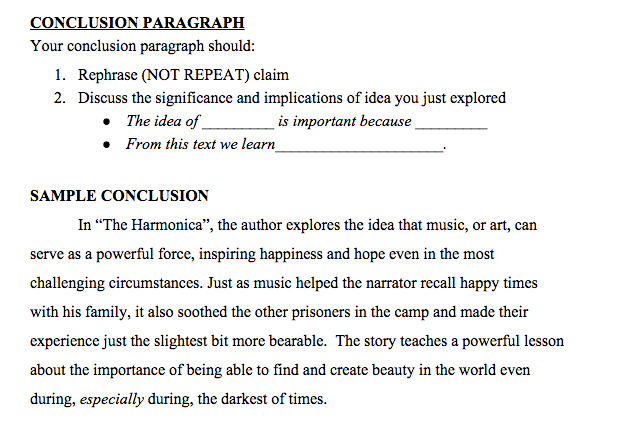 Strong writers write powerful conclusion paragraphs by rereading their essay and considering the significance and implications of their ideas. ​Strong writers improve their writing by receiving and using feedback from their peers.